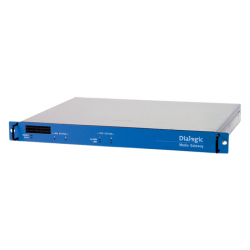 The Dialogic® 2000 Media Gateway Series (DMG 2000 Gateway) is a set of turnkey appliances that seamlessly merges traditional PSTN technology with IP networks. These economical media gateways consolidate typically separate voice and data networks and provide new differentiated communication services. Save yourself the hassle of making upgrades to your existing PBX equipment, and service providers will thank you and realize the benefits that come from a converged voice and data network with these Dialogic 2000 Media Gateways. The DMG 2000 Gateways can be installed and configured “plug and play,” thus reducing the total cost of ownership. Operations, Administration, and Maintenance (OA&M) features not only offer a user-friendly web interface but with advanced diagnostics and administration tools, the installation and maintenance of these gateways are quick to configure and manage. The DMG 2000 Media Gateways offer a cost-effective solution and the ideal solution for enterprises that are interested in deploying multiple applications such as PBX extension, remote office connectivity, long-distance consolidation, call centers, and IP media servers. Available in a 19-inch standard rack-mountable chassis, these appliances are also beneficial for service providers offering hosted IP-PBX, IP Centrex, and enhanced messaging servers. Click here for the Dialogic DMG 2000 Media Gateway by Sangoma datasheet. The Dialogic 2000 Media Gateway Series is a turnkey appliance that seamlessly merges traditional PSTN technology with IP networks.